Born and raised in Louisiana, Tim Malone started tournament fishing at the age of 14. He began fishing on his first bass boat at 15 and by the time he was 19, Tim had saved up to buy his very own. 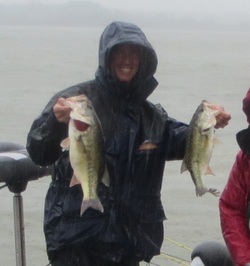 Malone continued to fish a number of tournaments including the Red Man, Red Man Golden Blend and the BASS Invitational. After attending LSU for one year, Malone decided to leave school in order to pursue fishing full time, working along the way so that he could afford to continue fishing tournaments. Malone met his future wife and married at 24 years old and now has two daughters, Courtney and Kaitlyn. Since having a family and spending quality time together was a priority, Tim chose to put his fishing career on the back burner, working local dealer shows and small tournaments. During this time, he also started his own business as a general contractor of Eagle Cove Development, as well as a food service equipment sales and repair company called Commercial Microwave Service. After 16 years this self--‐motivated angler is back on the back and ready to keep casting his line. Tim fished the Everstart Tournaments in the Southeast Division in 2012, finishing in 65th place overall and this year, finished 95th in the FLW Tour. His plans for 2014 include fishing the FLW Tour and the BASS Northern Opens. Malone’s current sponsors include Motormate, Top Gun Customz and Bunch Marine.